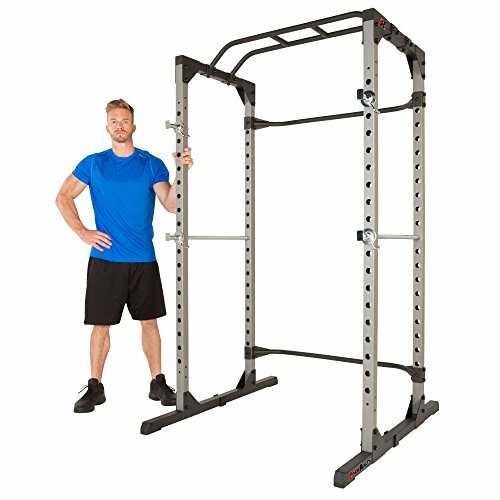 Whenever purchasing a rack for your at home gym, you want to make sure it is giving you the most amount of features possible. Today we are going to be looking at Pull Up Bar and Squat Rack Combos, so with just one purchase you have the ability to do both easily and efficiently. These are some of the most common workouts that can be done at home. 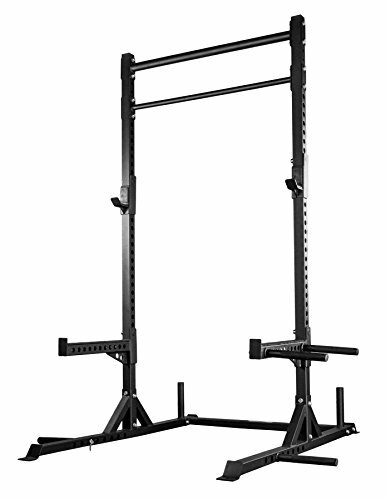 The first product up for review today is the Rep Squat Rack with Pull Up Bar – 1,000 lbs. Capacity. Developed by Rep Fitness, this Squat Rack is one of the more expensive options on our list today. Rep Fitness is known in the athletic community for their ability to make high quality products that are very safe. 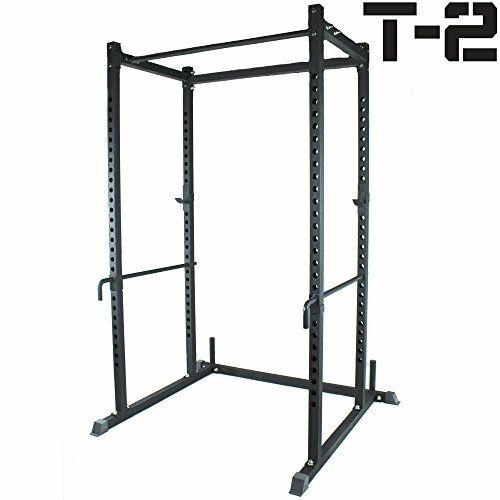 The Rep Squat Rack with Pull Up Bar – 1,000 lbs. Capacity when assembled measures 72 by 48 by 94 inches, but can go up to 110 inches high if that is preferred. For extra durability is has been made using 11 gauge steel that can hold up to 1000 pounds easily. It comes with a variety of things such as J-cups, weight storage pegs, arms to spot with, band pegs, and dip bars. To ensure no rust and that is lasts a long time, it has been coated using durable matte black powder. It comes with a 10 year warranty on everything, in case anything goes wrong. On the rack as well, there are 2 inch holes spacing, so you can adjust depending on your head. The base is 6 feet deep, so it is very stable and won’t fall over. In the rear of the rack are two weight horns, to ensure even more stability in the product. While intended for at home working out, it is strong enough for commercial places as well. It has the power to also be bolted down into the ground if you never want it to move. The second product up for review is the Fitness Reality 810XLT Super Max Power Cage. Fitness Reality makes products of quality but that are much more affordable than many on the market today. Now, whenever facing a workout machine that is very affordable, you want to make sure it is not sacrificing a lot of features, especially safety features, that you need for a good quality workout. There is no point in purchasing a workout device that is not going to last a long time. While some may be cheap at first, they will cost you more money over time due to upgrades and having to buy a new product. That being said, the Fitness Reality 810XLT Super Max Power Cage is not one of those products and is actually a great purchase. It has the ability to hold up to 800 pounds of weight for both the cage and the bench. There is a large space in between the sides, so you can move side to side easily and move around easily. It is a 2 inch by 2 inch square steel frame construction. It comes with two 3 ¼ inches long chrome safety bars that lock easily. It also comes with two 23 inches long safety bars that have been chrome dual mounted. There are 19 adjustable height levels to choose from and the safety bars can be used with 7 feet long Olympic Bars. No bars or weight plates come with this product. The final product up for review is the Titan Power Rack Squat Deadlift HD Lift Cage Bench. Titan Fitness is the most well known brand on the list today and they are known to offer products of the highest quality that are competitively priced. This product is no exception. It has the capacity to hold up to 700 pounds and also comes with HD J-Hooks. The uprights are made of steel and measure 2 inches by 2 inches. The chin up bar measures 1 ¼ inches in diameter. The pull up bar is placed 80 inches off of the ground, but can be adjusted. The weight of the whole unit is 107 pounds and the height is 83 inches. The floor space measures 48 inches by 48 inches, giving you plenty of room to move around in. The biggest thing always to look for in gym equipment is safety. Safety is so key in all things while working out. While work out equipment can be expensive, you do have to watch out about incredibly cheap equipment. Always ensure safety features have not been compromised just to give you a cheaper product. For power racks, you want to make sure they are stable and that there are no risks of it falling over on you. All three of the pull up bar squat rack combos above are definitely great purchases. They are all made out of durable and strong material, but are also very safe. They have been manufactured by companies that we know and believe make high quality products. Now since you know all of them, we encourage you to go to your local store and try them out in person. See what ones are going to work best for you and the workout you want to enjoy. We wish you all the best in your purchase.